He hadn’t planned on attending Brandon University. He didn’t even plan on working in Brandon. 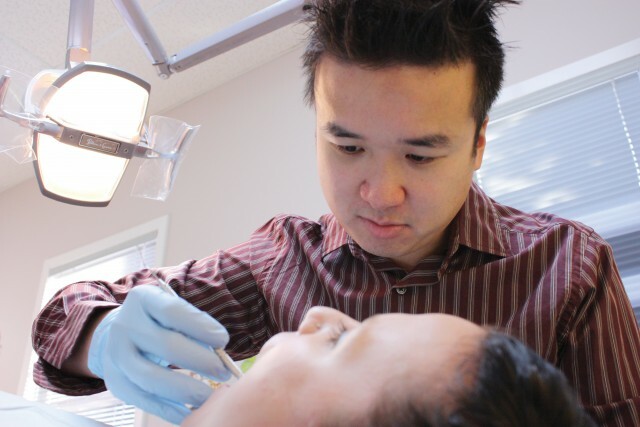 Today, Dr. Paul Chen (BSc ’01) is the co-owner of the largest dental practice in Manitoba outside of Winnipeg— the West-Man Dental Group serving 10,000 patients in Brandon and area. And he has high praise for his undergraduate years at BU. “Going to BU helped me prepare for and get accepted into dental school,” he says, relaxing in a quiet office at West-Man Dental Group. Intent on becoming a dentist, Dr. Chen applied to Queens University during his Grade 12 year in Brandon. He had already picked courses and arranged for on-campus residence. Then, a letter arrived from BU. Entering the Faculty of Science in 1997, Dr. Chen applied himself to a major in chemistry, benefitting from the smaller class sizes at BU. Dr. Chen credits BU first-year chemistry lab instructor Dave Ford in particular with helping prepare him for Dentistry School at the University of Manitoba, into which he was accepted in 2003 with a 3.84 GPA. He joined West-Man Dental Group in 2007 as an associate and, with a partner, purchased the operation in November 2012 from the three founding partners. Despite owning a thriving practice with a staff of 30, Dr. Chen remains modest about his accomplishments. This article first ran in the Winter 2012 issue of Alumni News, a bi-annual publication produced by the Department of Institutional Advancement.